This is the third in a series of blogs aiming to give the reader an easy ‘at a glance guide’ of where to go in sub-Saharan Africa and get the best out of it – after all there’s no point in going to the Kalahari for the zebra migration in June and wondering where they’ve all gone! And by the way the answer is back to the Chobe from where they left some months ago – it’s one of the longest mammal migrations in Africa at some 300 miles. 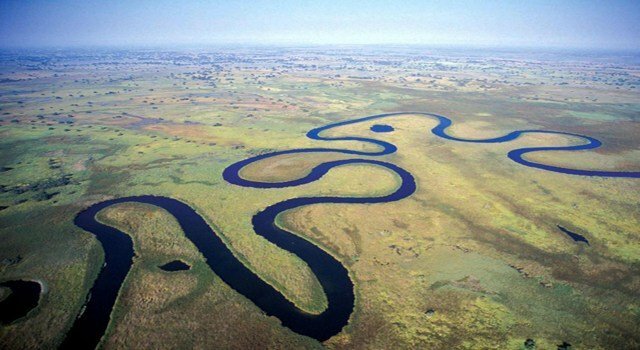 Botswana – July is the season of plenty in the Okavango Delta where the delta will be close to its peak annual inundation bringing in all manner of wildlife to take advantage of the abundant water and food and their associated predators. The days are warm with clear blue skies but when the sun goes down you’ll be reaching for your fleece and encircling the boma fire. The Kalahari Desert will now be entering its dry season with the summer rains long since evaporated and the grasses having died back. Game is less plentiful but the desert adapted species are abundant but you’ll need to be patient and be alert to see Aardwolf, Aardvark and Honey Badger. The sunsets and moon rises over the Magkadigkadi and Nxai Pans are superb. Try to be there at the time of a full moon. Wow! 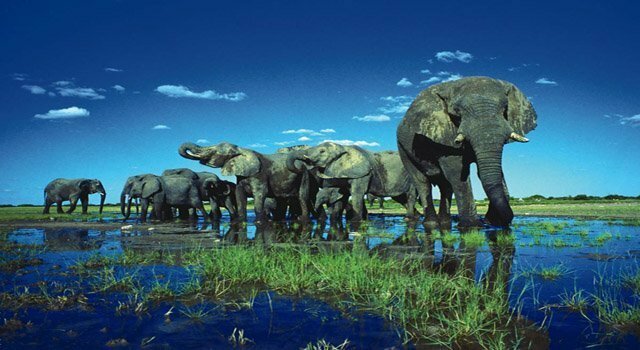 The Chobe National Park shows visitors good game all year round although elephant numbers will be less than in the spring months (November onwards). 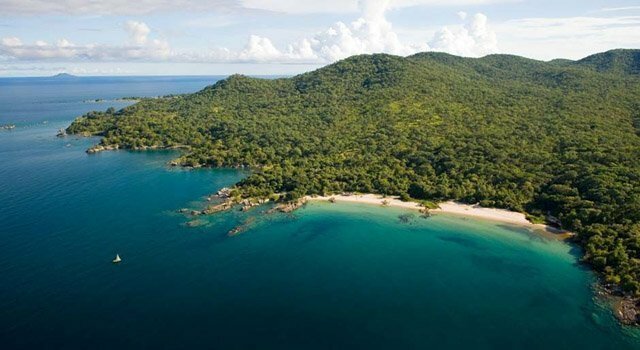 Malawi – although July is the depth of their winter, daytime temperatures are in the mid-20’s Celsius with 8 hours of sun and little or no rain, so better than our so called ‘English Summer’. I’d take advantage of these ‘cooler’ temperatures to plan an activity holiday – go to Nyika Plateau for some excellent hill walking (or Mount Mulanje for hiking) followed by Lake Malawi for water-sports such as kayaking and scuba diving. Namibia – July is peak season in Namibia not just because it is the traditional holiday season but also because it’s a great time to visit well away from the searing (but dry) heat that arrives later in the year. In the Etosha the rain that filled the huge pans is starting to evaporate with wildlife beginning to migrate towards the permanent water holes, ensuring great game viewing experiences. Away from the Etosha in the Hoanib and Huab river valleys, the plentiful times are coming to an end as the desert once again asserts it dominance. This is when the desert adapted game species comes into their own, travelling well-trodden routes to known sources of water. The lodges I would visit would be Damaraland Camp in search of the desert adapted Elephant and Anderssons’ Camp (Etosha) for all round good game viewing. Tanzania – the huge herds of the annual migration have probably be close to or have crossed the Grumeti River by now and are moving steadily northward towards the Mara River and their destiny with the crossings (for they often cross back again) into Kenya’s Masai Mara. 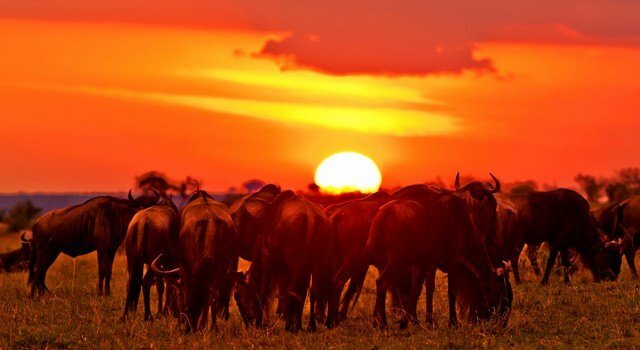 But Tanzania is not all about the Great Migration – this is probably the best time, from a weather perspective, to visit Tanzania as the tropical climate blesses July with hot days and warm nights, perfect for a bush and beach combination. There are many other superb national parks to visit from the Selous, close to Dar es Salaam to the Mahale National Park, with its chimpanzees, on the edge of Lake Tanganyika. My favourites at this time of year would be, Grumeti for the migration or Kiba Point in the Selous for a more general wildlife experience and Fundu Lagoon for your beach relaxation. 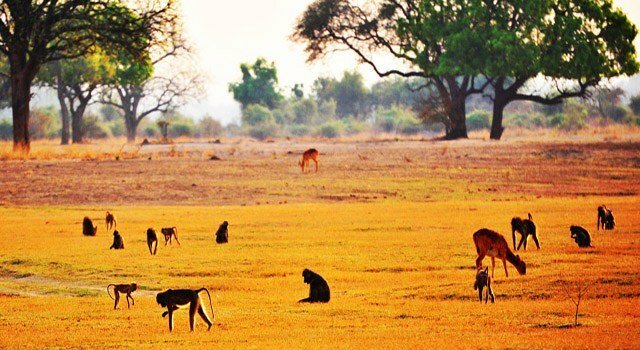 Zambia – the valley of the South Luangwa is certainly the place to be; this gem of a hidden valley is well known for sightings of leopards and perhaps a little counter-intuitively for its incredible walking safaris. The long rains are a distant memory with the rivers either reduced to a trickle or back underground; this is a time of hardship for the wildlife but especially those who need large bodies of water such as hippos. As the water recedes the pods become ever larger and tempers more fractious. There are some superb bush camps to visit at this time of year.